Photograph by D.A. 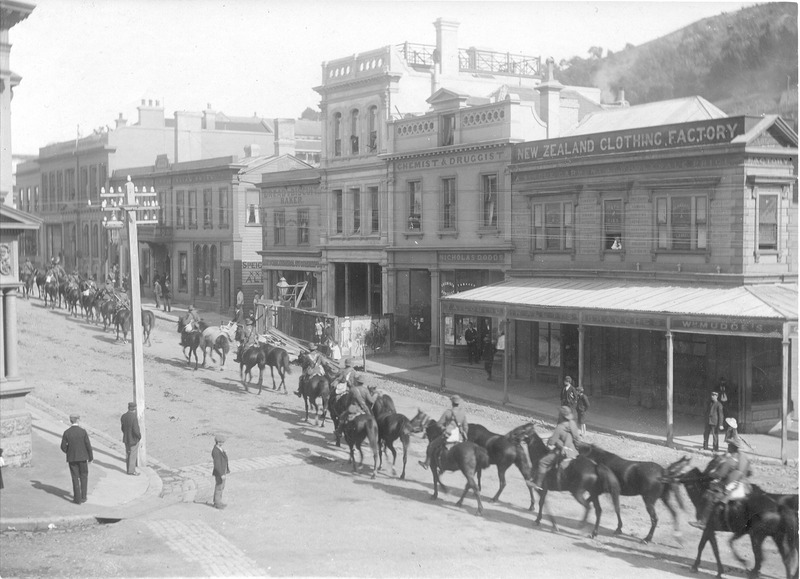 De Maus showing the arrival in Port Chalmers of the Auckland men, Fourth Contingent, prior to their embarkation for South Africa on 24 March 1900 (Second Boer War). Ref: Port Chalmers Museum. I love the tall, narrow proportions of this building – accentuated rather than softened by the composition of the facade. It could be seen as a bit fussy, but I find it totally charming and I’m sure it’s a favourite with many others, not least the regulars of the Port Royale Cafe. In the 1870s the site was occupied by one of a pair of modest two-storey timber commercial structures owned by Matilda Ritchie (1832-1918). She had arrived in Port Chalmers on the Jura in 1858, with her husband Archibald James Ritchie. Mr Ritchie died in 1870 and Matilda became a prominent landowner and businesswoman in her own right. She was described as one of Port’s philanthropists, and ‘very good to people in need’. 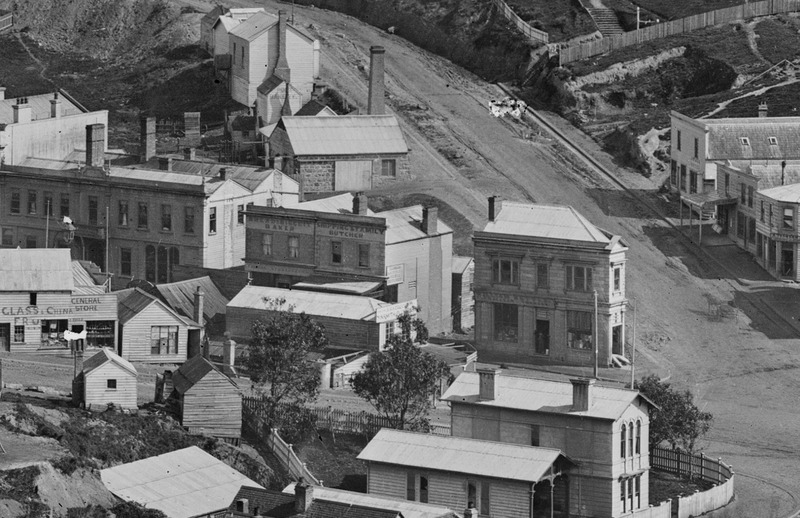 Detail from a mid-1870s Burton Brothers photograph showing the site of the present structure. The building on the site has a sign reading ‘Shipping & Family Butcher’. To its left is a matching building with the sign ‘Bread & Biscuit Baker’). Note that most of the buildings are of timber construction. Ref: Te Papa C.011806. 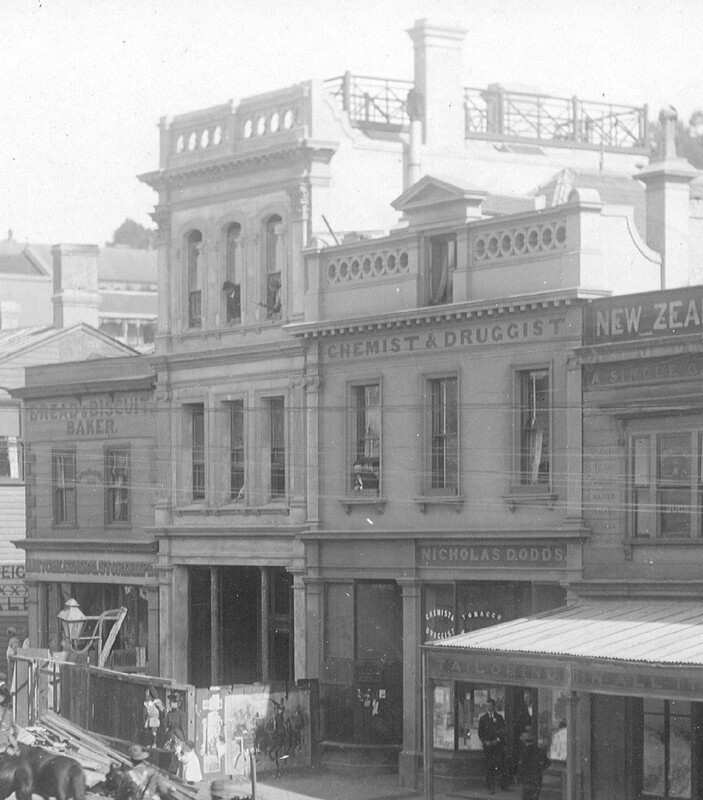 In October 1899, architect James Louis Salmond called for tenders for the ‘erection of a shop and dwelling in George street, Port Chalmers (Brick)’. 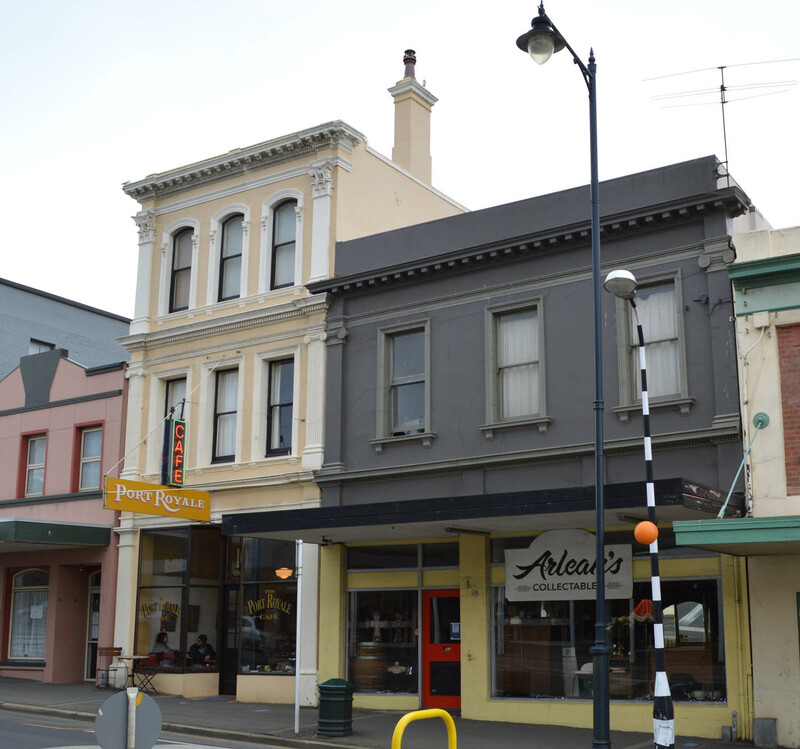 In the same issue he placed a notice advertising the sale ‘for removal of a two-storeyed wooden building in George Street, Port Chalmers […] Tenders may also be lodged with Mrs Ritchie, Port Chalmers’. A photograph dated March 1900 shows the building in a near complete state, but still with hoardings up and without its shop front. Detail from the D.A. DeMaus photograph, March 1900. Note that hoardings are still up and the shop front is yet to be completed. The image shows parapet and roof details since removed. The style of architecture is Renaissance Revival or Victorian Italianate. Originally the roof had an observation platform surrounded by iron railings. This would have provided excellent views of harbour movements, and for the same reason a similar platform was on the roof of the Port Chalmers Hotel. The facade was richly decorated, including plain pilasters with impressive Corinthian capitals on the second floor, and fluted Ionic pilasters on the first floor. The latter referenced the neighbouring building at no.6 (designed by David Ross in 1881), as did a repeated circular motif used on the parapet balustrade, with both showing a sensitivity to context on the part of the architect. 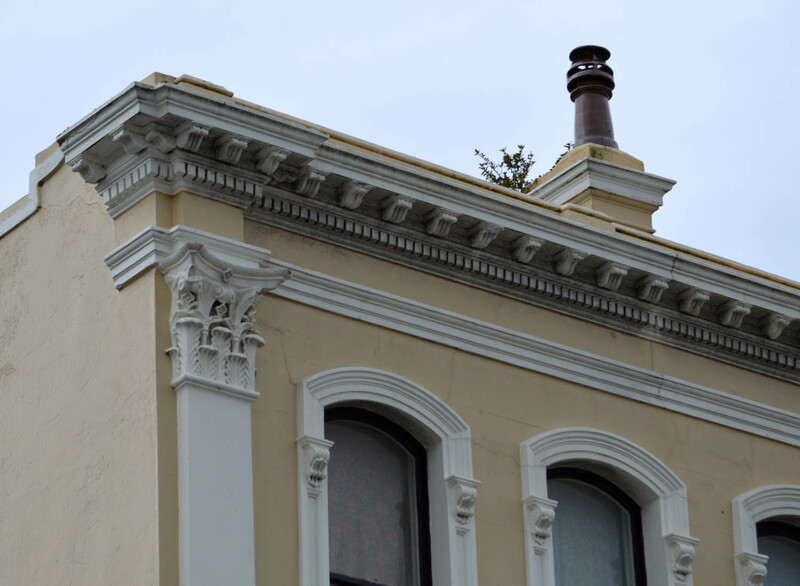 The parapet ornamentation is lost but the decoration below survives, including a fine dentil cornice with modillions, and consoles in the second-floor window surrounds. The roof was renewed in 1969 and there are no longer railings in place. The first tenant of the shop was the watchmaker and jeweller Albert Edward Geddes, who remained until about 1905. Another jeweller, Alfred Isaac Peters, was there c.1915-1930. Among the businesses that followed were cake shops (1950s-1960s), a takeaway bar (1970s), and an office of the law firm Downie Stewart & Co. (1980s). In the 1990s it was occupied by Aero Club Gallery, and it has been the Port Royale Cafe since 1998. Church, Ian. Port Chalmers Early People, p.684. 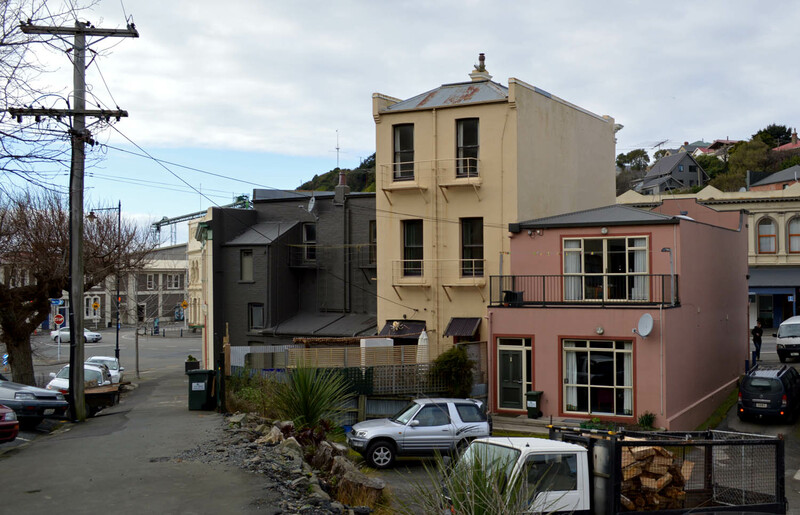 This entry was posted in Buildings and tagged 1890s, 1900s, James Louis Salmond, Matilda Ritchie, Port Chalmers, Renaissance revival, Restaurants on 28 April 2015 by David Murray.